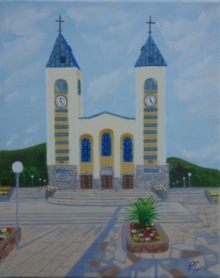 Medjugorje, as well as the major part of Herzegovina, has Mediterranean climate. This means that summers are humid, long and hot, while winters are rather mild. Located between the Herzegovinian mountains, Medjugorje gets cooler temperatures thanks to the winds coming from the Adriatic sea. This wind, locally called and knows as “bura” also brings some snow from the neighboring mountains. Snow is not very common in this part of Bosnia. Temperatures rarely fall below zero Celsius, but strong wind can fool locals and make them believe it is a lot colder that it really is. If you plan to visit Medjugorje during winter months, pack warm clothes. If you have sensitive skin, the wind can make it even more sensitive and dry, so it is recommended to bring lotions that will keep your skin moisturized and healthy. During the colder months, rainfall is very common. Adriatic Sea brings warmer air to this part of the country, which is the reason why Medjugorje has Mediterranean climate. Winter is at its coldest when this usually dry wind blows almost every second day.